The pulleys are perhaps the most important components of extension springs. And so in spite of their rather small size, they are crucial garage door parts. That’s easy to understand if you take into account how significant springs are to the garage door operation. Leave your sectional doors springless and see if they will ever go up. Back to the garage door pulleys. Like any other component, they are not immune to damage. They will wear, split or break and hence cause a series of serious garage door performance problems. 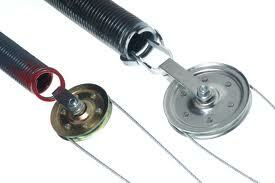 To understand better the importance of pulleys, let us see how extension springs for garage doors work. Most garage doors are sectional today and this means they consist of panels which are hinged together while each panel is also hinged to the rollers that run in the tracks. Now, here is where you find the cable and pulley system too. The extension springs found on both sides of the garage door are connected to the cables through pulleys. As you most likely know, these stretch springs counterbalance the door’s weight. But in order to open and close the door, all components must be in optimal position. When the door closes down, one end of the cable will follow the journey all the way down to the floor while the other end will remain secure on the garage door tracks – but it will have to run through the pulleys. 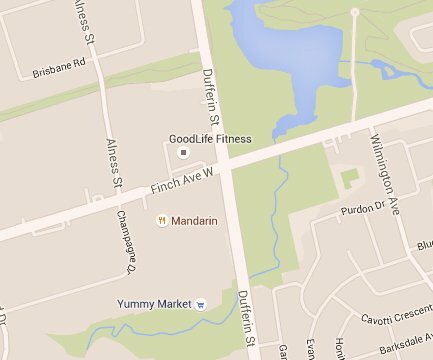 So, what are the garage door pulleys? They are the small and round components, which often have ball bearings for smoother operation, and allow the garage door cables to run through them to the tracks. There are four pulleys on each sectional door – two on each side. One is stationary and mounted on the horizontal track and the other consists of a pulley fork and is attached to the spring. The pulleys turn (and must turn) smoothly to enable the door’s movement. But they will come a day when they will wear and then there will be a problem. Most of the times, pulleys wear along with the springs. And so if garage door spring replacement is needed after 10,000 cycles, it’s best to replace the pulleys too. Even if they seem okay for the time being, they will soon cause some trouble. And pulley troubles are always serious. Which are the most common garage door pulleys problems? These are often clear indications of pulley problems. Binding and jamming often occur when one of the pulleys is broken. Replace all four of them. The other three pulleys might not have caused troubles yet but they will very soon. Remember that extension springs are meant to counterbalance the weight of the garage door. If the pulleys on one side are new but the pulleys on the other side are old, you will soon have a problem with the garage door balance. And that’s not good either for your safety or door performance. Replacing garage door pulleys is not easy either. It demands expert knowledge so that all precautions are taken and the spring pulley system is properly replaced. Pulleys won’t only break or split but also loosen up. And so you will feel the garage door shaking or moving in a funny way. You might notice that one or more pulleys are worn around the bearing area. Don’t let these problems get worse. 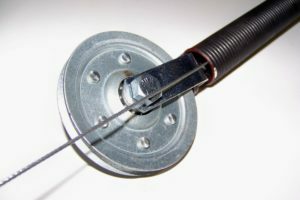 It’s important to call in an expert in garage door spring repair.